Cloud resource sprawl is one of the common dilemmas faced by enterprises with large scale cloud deployments in any cloud, including Azure. Challenges such as unnecessary costs and protection holes can have real negative impacts on budgets and operations. NetApp has a solution to fix this. The Cloud Assessment tool from NetApp helps you optimize your cloud costs by identifying unused disk resources and unassociated snapshots, and pinpointing data protection holes in your Azure deployment. In this blog, we’ll explore the capabilities of this free Azure assessment tool as well as the cloud storage management benefits that come with Cloud Volumes ONTAP. Orphaned Azure disks and snapshots often go unnoticed if there is no cloud monitoring tool to keep tabs on them. These Azure disks and snapshots still incur charges even if they are not associated with any virtual machines. Snapshots form the basis of any organization’s business continuity and data protection: if not scheduled properly, your environment will be at risk. Handling these resources in an efficient manner while keeping the cloud sprawl in control is very important in any Azure deployment. However, most enterprise deployments are large enough for users to lose track of these resources. Below we’ll take a look at how that happens. Virtual machines provide the basic compute capacity in any Azure cloud service deployment. VMs have managed disks attached to them for use by the operating system and for data storage. Deleting a VM can take place whenever a user no longer has use for that instance—however, that does not delete the associated Azure VM storage on managed disks. Those disks remain orphaned unless deleted manually or via scripts. In certain scenarios, it might be required to detach data disks from VMs which would remain in the environment until similarly discovered and deleted. The charges associated with managed disks depend on the size of the disks provisioned, and are billable whether they are attached to VMs or not. For example, an unattached Premium SSD disk of 1 TB could incur annual charges of $1475 even if not in productive use. Point-in-time copies of the data disks, known as snapshots, provide data protection. These snapshots are usually taken periodically, or before any major changes are made to an environment. Snapshots help in fast recovery of VMs to an earlier version in case a rollback is required. Deleting VMs or disks does not delete the associated snapshots, which is useful as they might be required in future, either as backup or as reference points. However, they will continue to rack up charges. Snapshots are charged based on the size of data in the parent disk and the changed blocks when snapshots are taken. However, it is important to audit and remove the unused snapshots regularly to keep the cloud storage charges from spiraling. Since snapshots are charged at $0.05/GB per month based on the size of the disk for which they were created, a snapshot of disk with 2 TB data would cost $1228 a year, whether it is associated with a disk or not. Data resources without snapshots create an environment with data protection holes. Unprotected Azure managed disks could pose a serious threat to your organization’s business health. Even if you have a backup solution implemented, snapshots offer more granularity by providing point-in-time recovery capabilities that help meet your organization’s RPO requirements. Frequent snapshots are required in fast-changing environments to ensure optimal data protection and to meet desired RTO. The lack of a snapshots policy can lead to data protection holes and result in business losses and operational setbacks. Frequent audits should be done to review snapshot policies and corrective actions will ensure that your data resources are adequately protected. NetApp’s Cloud Assessment can help with that. NetApp Cloud Assessment for Azure is a free tool that analyzes your cloud resource usage and provides solution insights for cost-savings opportunities. Identifies cost-savings opportunities by reporting on unused Azure managed disks and snapshots that could impact your monthly cloud bill. Helps pinpoint data protection holes by identifying inadequately protected data resources. Provides recommendations on how to optimize Azure Storage use. Shares insights on how NetApp can help improve storage efficiency through thin provisioning, automatic resizing, data management alerts, and more. Once you run the tool, you’ll receive a report that consists of two main sections: Savings Opportunities and Protection. Savings Opportunities: This highlights the annual savings that can be possible by deleting unattached disks and unassociated snapshots. You can also download a report in CSV format with details of the unattached disks and unused snapshots. This report will help you drill down into properties such as disk name, subscription, and details about who created those resources so that they can be tracked down and deleted if not in use. Protection: The results found in the Protection section show how well-protected your environment is in terms of disks without snapshots. It will also highlight the average RPO based on the current snapshot policies so necessary corrective action can be taken. The results will also show you how Cloud Volumes ONTAP can help you overcome the above discussed challenges of unused Azure managed disks, snapshots, and data protection holes. Cloud Volumes ONTAP provides a fully-functional version of trusted NetApp ONTAP software running natively in the Azure cloud. Cloud Volumes ONTAP helps to reduce storage footprint, which can be a major help in lowering your TCO, a benefit you can see demonstrated on our Azure calculator. This is possible through data deduplication, thin provisioning, compression, compaction, and automated storage tiering of infrequently-used data to low-cost object storage on Azure Blob. NetApp Snapshot™ technology addresses your data protection needs by creating point-in-time copies of data with no disruption to your running applications. These copies only consume storage space for data that is changed, a capability that is not natively available in Azure. The Cloud Assessment tool can be leveraged by organizations to identify unused resources that will help to bring down cloud storage spend as well as address data protection holes. It also provides insights on eliminating cloud sprawl using Cloud Volumes ONTAP. 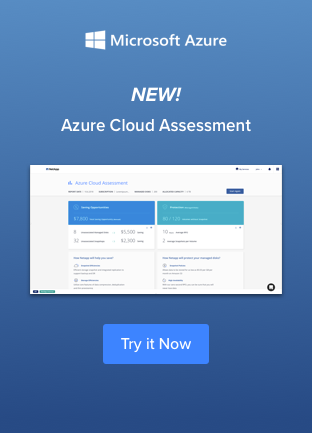 To understand the best-in-class data management service try the Azure assessment tool and get started with a free trial of Cloud Volumes ONTAP today.